After the Climate summit it was time for reflection. It was started in a broader scale by Knud Vilby, the spokes person of the 12th December initiative. On the 6th of January his open letter on Denmark’s freedom and legal situation was published in the daily Information were he had been editor in chief in the 1970s. His attempt was made in the by now typical Danish way to act regarding the assault on democratic rights during the summit. It was done on individual basis and made no appeal for collective responsibility from the Danish organization that had invited 100 000 people to come and protest and then being degradingly treated by the police. Instead the former spokes person of the 12th of December initiative Knud Vilby addressed ”Denmark”. We need to have a thorough conversation in our society about the way Denmark changed in December. • Huge popular climate demonstrations were – at a very few exceptions – very peaceful, but nevertheless resulted in 2,000 arrests or detentions. This has never happened before. • The distinction between violent and nonviolent civil disobedience effectively disappeared when the police and courts responded with the greatest violence against the non-violent actions. • The gap between the judicial and executive power faded from sight, and the distinction between guilty and innocent blurry as police condemned many innocent temporary imprisonment. The letter opens up for a much needed self critical discussion among Danish organizations and their international cooperation partners not only regarding the repression of the December 12 demonstration but also against Climate Justice action and other protests during the summit. There are some clear limitations. That still the false story of cobble stone throwing black dressed activists having wounded a policemen which made demonstrators welcoming the police intervention is promoted is one such limitation. The other is the elitist and state centric view. ”The next major action was the Climate Justice Action’s action. It was to bring critical demonstrators with critical delegates together at the Bella Center area. CJA had put everything openly forward. It was civil disobedience, but peaceful and non-violent. Personally, I was however very worried that protesters would drop peaceful unity when police arrested a day before one of the leaders, a known moderate German CJA activist. It was contrary to common sense and the advice that the police had received as part of the dialogue with them. 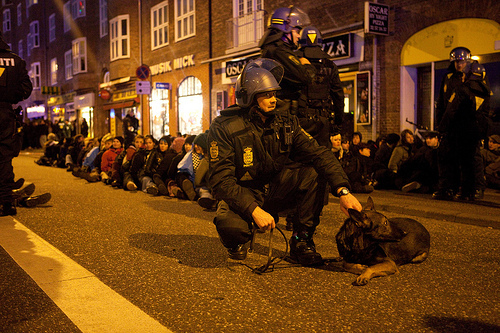 It became even worse when one arrested two young Danish CJA responsible leaders. It was e.g. Stine Gry, which was part of 12.dec. planning and who had collaborated and informed fully open. She was rewarded with phone tapping and imprisonment. Vilby and many formal Danish organizations do not trust the people. To them it is a surprise that people without leaders can still hold on to the main goal of an action. One can hope that some of them now will learn, at least Vilby seems willing to. The greater problem is the focus on the state while the rest of the people is supposed to behave under responsible leadership. Vilby address the division of power between judicial and executive powers and a vague ”Denmark” which somehow is supposed to put things in order until next time. He rightly not only criticizes the government but also much of the opposition unfortunately without being at all specific. 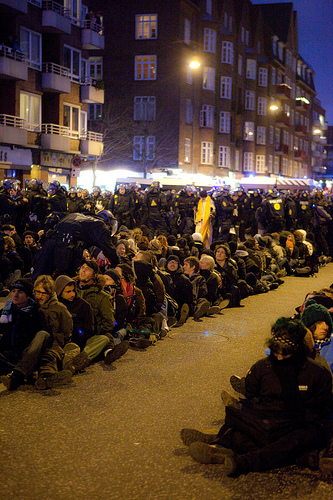 But the most immediately responsible is not criticized, the Danish 12 of December demonstration committee. Democracy is not only coming to life via government and political party opposition resulting in laws and implementations by executive organs. It is even more nurtured by all agreements in daily life ruled by written or unwritten laws maintaining commons of different character. We meet and we agree upon things and build trust. The Danish 12 of December Initiative have invited us to demonstrate and it is their duty to protect every participant and the integrity of the whole demonstration. Not to use the 100 000 voices for their individualistic interests and promote the branding of their own organization while turning their back at the whole collective responsibility as quick as they get the chance to find new ways of branding themselves. That the state can behave extreme is not totally new. What is historic about Copenhagen is that the organizations of the host country supported the police against the demonstrators in a demonstration that they themselves had organized. It is the duty of all demonstration committees that have any decent sense of democracy to collectively respond to the kind of massive repression against a demonstration which was enacted by the police in Copenhagen. It is also their duty to denounce those organizers of the demonstration that uses the opportunity to support the police perspective and the mass arrests thus escalating repression further. The state has as we know many different limitations in living up to democratic standards based on equal rights for all. Already the geographic limitations makes this obvious in a case when those states that emits most green house gases are those that have economic power to marginalize the voices and the rights of impoverished countries that carries the main burden of climate change as well as many other effects of unequal distribution of wealth and environmental destruction. Thus it is important to demand democratic behavior of everyone in society, especially when voluntary agreeing to cooperate and inviting demonstrators from the whole world as the Danish committee have been doing. This demand for accountability has the advantage of being much easier to fulfil. Danish organizations signing the agreement behind the 12th of December demonstration should have not problem at all to come to a collective decision in majority or consensus on what happened and how to respond to repression including demanding an answer from those organizations that chose to support police perspectives and mass arrests. The days when Danish organizations can continue to act individually and maintain their democratic respect among organizations and movements in the rest of the world are over. The Climate summit was not an internal Danish business, it was of importance for the whole world. But it was only Danish organizations that fully could prevent repression and stop it from escalating. They have utterly failed to do so and instead used the opportunity for competing individualistically with each other with those Danish organizations that was elected to have speaker at the demonstration at center stage. Instead of being democratic and call a meeting and decide collectively how to respond to the repression of movements from the whole world the Danish organizations behave as branding actors on a market in their full right to do as they pleased. This is to betray both democracy and a strong climate movement. The discussion in Denmark Vilby calls for on state behavior is necessary, but first we need a collective democratic effort to see who fulfilled their plight to the foreign and other guests and who did not. 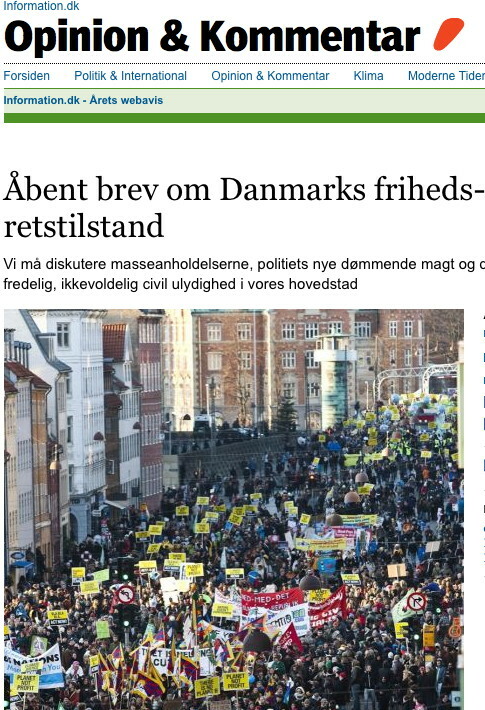 Maybe it would even be possible to find out why formally democratic Danish organizations when put to the test refused to use democratic means and take their responsibility as supporters and organizers of the demonstration to collectively counteract the state repression against their manifestation to which they had invited people trusting that the Danish organizers were reliable. It is about time that we as movements starts to make code of conducts when cooperating and strongly criticize those organizations that formally claim they are part of the collective effort but do not follow the rules in self interest to brand their own organization. Democracy is here and now, reclaimed all the time in our daily lives, at the workplace, at home, when we cooperate in smaller or larger scale. It is not something as Red Green Alliance stated about the demonstration, a question about acting in a way” that sends a clear signal to those in power”. To instrumentalize participants in a demonstration or other form of movement cooperation stating that the only thing that matters is to ask others to do something is not democracy, it is elitism. When it is combined with refusal to collectively counteract repression it is anti democratic and paves the way for an authoritarian state. The attempts by Vilby to open up for a self critical debate and the positions of organizations as the social liberal party, young right wing liberals and climate justice action activists in Denmark shows that there are forces and possibilities to learn from the course of events in Copenhagen. But we cannot come further without that concerned organizations in Denmark and abroad collectively takes responsibility, investigate in how the collective solidarity especially from Danish organizations failed and decide how this should be addressed in the future. Especially important is it that those Danish organizations that had the key possibility to do something but did not are called into question by their national and international partners. It is especially three left wing parties, with important fraction five political organizations, that have failed to support collective solidarity and at times supported a police perspective or even fully support the police intervention. It is the Social democratic party, the Socialist People’s Party and the Red Green Alliance were both fractions of the 4th international and the Internationalist Socialist allied with the Socialist Worker’s Party in Britain play a crucial role in the mass activities during the Climate summit. We need to know if these parties and other parties are willing to learn and change their individualistic behavior at COP15 in the future or if they will continue to constitute a threat to protest movements also after Copenhagen. We need to know if their international sister parties agree to what their cooperation partners did in Copenhagen and if one can expect the same behavior from them in the future or if they are willing to jointly with the peasant, environmental and the whole climate justice movement confront repression and criminalization of popular movements.